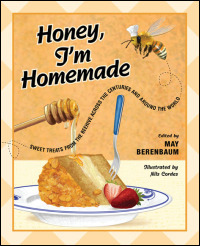 Honey, I'm Homemade by May Berenbaum is a neat little book - part entomology, part history and all yummy! Subtitled Sweet Treats from the Beehive across the Centuries and around the World, this book offers a look at where honey comes in the first chapter, entitled Honey: The A-Bee-C's. It also takes the time to look at how various cultures use honey and how honey varies around the world - which is fascinating... but what is even sweeter are the recipes. The recipes come from all over - some historical, some prize-winning, others from around the world. The name pfeffernüsse translates literally to “pepper nuts” and refers, respectively, to the spicy taste and general shape of these traditional Christmas cookies from Germany. Heat honey and molasses or syrup over low heat in a small saucepan for about 10 minutes. Add butter, stir until melted; remove from heat and let cool. In a large bowl, sift together the dry ingredients. When honey mixture is lukewarm, whisk in the egg. Pour honey-egg mixture into the dry ingredients, mixing until well blended. The dough may be refrigerated to firm it up for easier rolling. Roll dough into small balls and bake on ungreased nonstick cookie sheets for 13–15 minutes, or until cookies hold their shape if tapped. Remove from pan and cool before frosting. Yields 5–6 dozen small cookies. Whisk egg white, honey, and vanilla together until creamy. Sift powdered sugar over mixture and mix until smooth. Place a handful of cookies in small bowl, drizzle with few tablespoons of frosting, toss carefully until coated. Place cookies on a rack so icing can drip off. Repeat until all cookies are frosted. Let cookies dry before moving. to look like pepero sticks. Mix flour and sesame seed oil together thoroughly. In a separate bowl, combine liquids and add to the flour. Knead to dough-like consistency. Flatten dough into a square ½ inch thick and cut into long thin strips, then cut each strip into three even portions. Use a fork to poke holes into the sticks. In a separate pan, make syrup by mixing sugar and water and boiling to reduce volume to 1 C. Cool slightly and add honey, cinnamon, and ground ginger. Heat oil to 350–375 degrees. Deep fry dough until golden brown. Dip the cookies into the honey syrup, allowing it to soak through. Sprinkle with chopped pine nuts before serving. Note: If you don’t have ginger juice on hand, peel and grate fresh or frozen ginger root. Squeeze grated ginger through cheesecloth or a garlic press to extract the juice. But the recipes vary to include such delicacies as Cranberry Pudding with Honey Sauce (Armenian), Gram Bea's Saskatoon Pie (Canadian), Melopita (Greek Ricotta and Honey Pie), Yemarina Yewotet Dabo (Spiced Ethiopian Honey Bread) and an abundance of other cookies, cakes, sweets and savories! This book is a great kitchen resource for anyone who bakes and wants to experiment with using honey to flavor and sweeten their baking! I highly recommend it to everyone with a sweet tooth and anyone who loves the sweet, sweet taste of honey!